I did a fresh install of Opera 25 and everything is working okay. Then today all of a sudden a floating panel (???) kept re-appearing on the bottom-left side of my browser window. Even if I close the panel it keeps popping up again and again. FYI, it happens on all websites (does not depend on the url). Please let me know whats happening here? Is that a bug or something? How do I stop it from popping up again? My system: Yosemite 10.10, MacBook Air 2012, Opera 25 (fresh install). Help. I noticed that as soon as I activate a tab the panel pops up. Other times when I scroll a long page it pops up again. Could not pin-point the event that is causing it to re-surface. There is a close button that lets you close it, but it keeps coming back. I hope there will be a way to disable this, otherwise, I would have to switch my browser. Not sure how "fresh" that install of Opera was on your system. But I wasn't able to reproduce that issue. I tried both Opera 25 and Opera Developer 27. 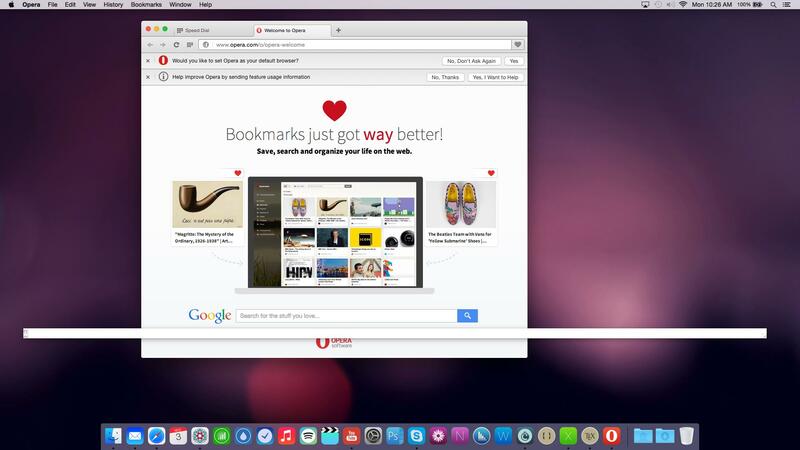 By the way, could you try Opera Developer as well? Also, I tried opening the same page as you did in your screenshot, just for the sake of it, and nope, no floating element on my screen. Looks like a js is running in background. Maybe an extension of some sort is kicking in? You could try disabling/removing all extensions (in case you've got any installed) and try again. Before installing Opera 25 I have removed every folder/files associated with Opera from the Library folder/Cache etc. Thats the reason I am considering it to be a fresh install. I have removed all the extensions that I have installed previously, but still the floating thing keeps popping up. What do I do? I shall try the Opera Developer 27 and let you know the results. Thanks again. The panel at the bottom pops up repeatedly. Whats going on here? Can anybody help with this? I installed Opera 26 Beta and so far it does not show that pop-up panel at the bottom. Well, as I said, that fresh install wasn't really fresh. Now, to be honest, I have no idea where does Opera save its config and data files, cause I'm pretty sure that's what's causing you these issues. Not sure why you didn't go for the Developer version. It's absolutely nothing wrong with it. For what it's worth, it's better than any other Opera version. Anyway, your issue is not related to opera. It's related to the messed up config files on your computer. And now that you installed another version, you know that's true. By the way, nice wallpaper. What is it?